I just returned from vacation & wanted to get at least one official trade idea added before we head into the weekend. 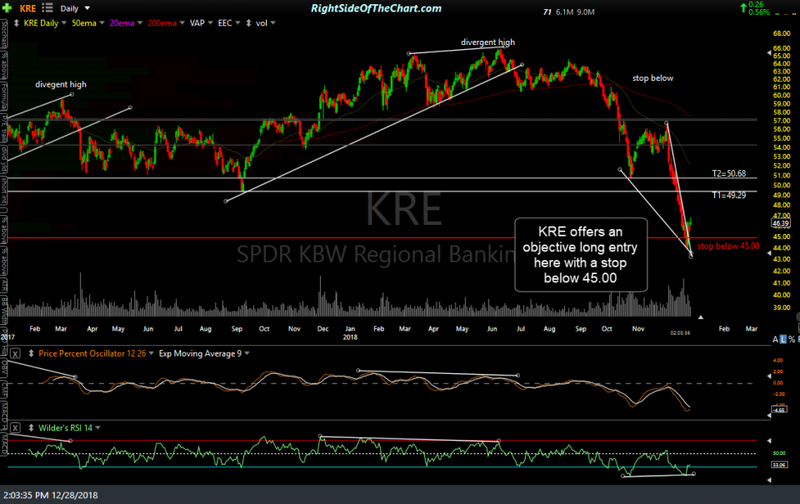 KRE (regional bank sector ETF) once again offers an objective long entry here with a stop on any move below 45.00.The price targets for this trade will be T1 at 49.29 & T2 at 50.68 (revised slightly below the final target on the recent KRE trade) with a suggested beta-adjusted position size of 1.0. I’m just getting back from the park now after another long day but wanted to say that while two days doesn’t make a trend, it is certainly a start with the market appearing to have shifted from distribution mode to accumulation with what I think is a fairly high likelihood of additional upside in the coming weeks+. If things play out as I suspect going forward, trying to short rips may to prove to be difficult over the next week or so. I will be returning from vacation tomorrow afternoon & will post a comprehensive update then. Although I haven’t had the time to add back any of the recently stopped out long trades back as official trades (IWM, QQQ & KRE), price targets for all three would be the same as the recent trades, which can be referenced via the Completed Trades- Long category under the main menu or by selecting those symbol tags from the drop-down menu near the bottom of the sidebar on the right side of the trading room. here we go again, thanks Randy, give it a shot! Banks?. Pretty much the worst acting group in the stock market. Yesterday’s loser, tomorrow’s winner. Such is a fast-moving market.